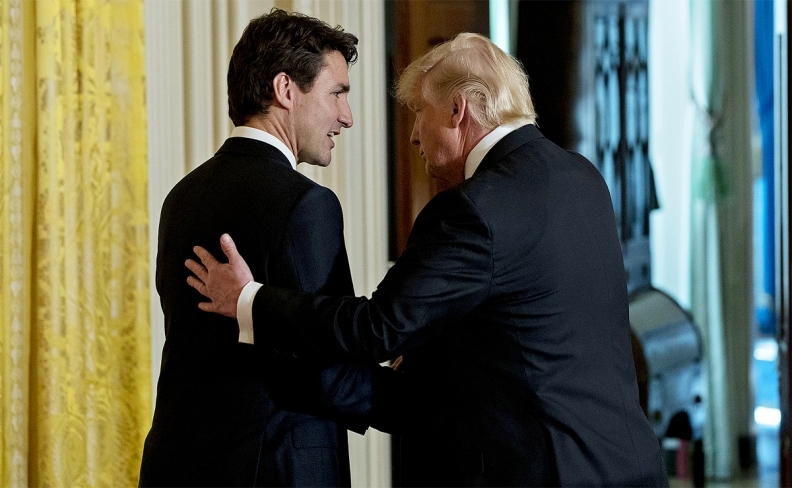 WASHINGTON — Canada can breathe easier, for now: It's getting relief from U.S. tariffs for an undetermined period, as one of only two countries receiving a provisional exemption from the steel and aluminum penalties set to clobber the rest of the world. U.S. President Donald Trump signed proclamations Thursday slapping tariffs of 25 per cent on steel and 10 per cent on aluminum, and they snap into effect for the rest of the world in 15 days. After months of frantic lobbying, diplomatic arm-twisting, and heated debates within his own administration, Trump made good on his tariff threat at the White House, surrounded by steelworkers. He held off on threatening America's neighbours. Trump danced around the question of whether the threat of tariffs will be used to bully Canada and Mexico at the NAFTA bargaining table. He said only that the reprieve remains in place for now, and that NAFTA is important to economic and national security. "Due to the unique nature of our relationship with Canada and Mexico ... we're gonna hold off the tariff for those two countries," Trump said during the ceremony. "If we don't make the deal on NAFTA, and if we terminate NAFTA ... we'll start all over again. Or we'll just do it a different way. But we'll terminate NAFTA, and that'll be it. But I have a feeling we're gonna make a deal on NAFTA... If we do there won't be any tariffs on Canada, and there won't be any tariffs on Mexico." That retains the semblance of a legal fig leaf for the administration. By law, the tariffs need to be described as a national security matter. A provision in a 1962 U.S. law allows the president to set emergency tariffs as a security issue. But the White House has repeatedly undermined its own legal case, including by intimating that the tariffs would be lorded over Canada and Mexico as some kind of negotiating tool to extract NAFTA concessions. The White House is now clearly avoiding that kind of talk: "We will have ongoing discussions with Canada and Mexico," a senior White House official said in a pre-announcement briefing. "NAFTA discussions will be part of that only because NAFTA is an important part of the security relationship within the hemisphere." Unifor, which represents 40,000 Canadians in the auto industry, says the exclusion of tariffs on Canadian steel and aluminum exports to the U.S. is simply a stay of execution. The aide expressed frustration at the way the tariffs have been characterized, referring repeatedly to the "fake news," the lobbyists and the "swamp things" that he said exaggerated the ill effects while fighting the measures. But the same official said it truly is a matter of national security — with six U.S. aluminum smelters shutting down the last few years, and just five remaining, and only two operating at full capacity, he said that leaves the U.S. at risk of having to import all its aluminum eventually. In one alleged example of haphazard policy-making, a report this week said the president raised the tariff rates for branding purposes, increasing them from the 24 and 7 per cent recommended by the Department of Commerce — because he wanted nice, round numbers. Canada's ambassador to Washington dined this week with U.S. national-security adviser H.R. McMaster; Foreign Affairs Minister Chrystia Freeland, Natural Resources Minister Jim Carr, Defence Minister Harjit Sajjan, and Transport Minister Marc Garneau all reached out to cabinet counterparts in recent days. The lobbying found a mostly receptive audience: the U.S. military strongly resisted tariffs against allies, and 107 congressional Republicans released a letter this week to express their alarm over the move. Expect a low-key response from Canada if Trump indeed intends to use temporary tariff relief as a bargaining threat. That means no talk of walking away from the table, nor any hint of making concessions under pressure. "Our position hasn't and won't change," one Canadian source said Thursday. "We're after a good deal, not any deal. We'll take no deal rather than a bad one."